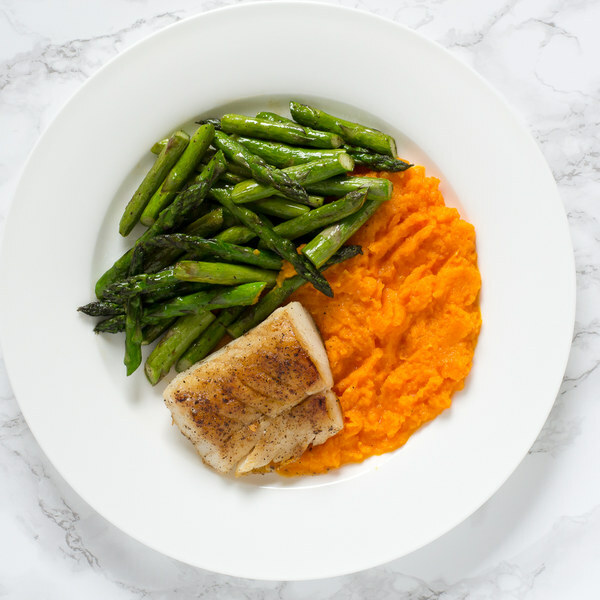 ← Pan-Fried Cod with Asparagus & Carrot Purée. Peel the carrots, then trim off the ends; discard the peels and trimmings. Cut the carrots crosswise into 1-inch chunks and transfer to a medium saucepan. Cover the carrots with hot water (from the tap) by about 1 inch; bring to a boil over high heat. Snap or cut off and discard the woody ends of the asparagus; cut the spears into 2-inch pieces at an angle and transfer to a bowl. Once the water in the saucepan is boiling, reduce the heat slightly and simmer until the carrots are tender when pierced with a knife, 15 to 20 minutes. Once the carrots are cooked, reserve 1 cup of cooking water and drain the carrots in a colander. Return the carrots to the saucepan. While the skillet heats up, pat the cod dry with paper towels and place on a plate; season generously with salt and pepper on both sides. Carefully place the cod in the skillet; cook until it is opaque throughout and flakes easily, 2 to 4 minutes per side (depending on thickness). Once done, transfer to a plate. Once the cod has been transferred, add more coconut oil to the skillet, then add the asparagus and season with salt and pepper. Cook the asparagus, stirring occasionally, until bright green and tender-crisp, 3 to 5 minutes. Once done, remove the skillet from the heat. To the carrots, add ½ of the reserved cooked water, garlic, butter, salt, and pepper; mash with a potato masher or puree with a hand blender until smooth. Add more cooking water to thin out the mash if needed. To serve, divide the carrot purée between plates, then top with the asparagus and cod. Enjoy!